Small fairy gardens nestled into tree trunks are easy to miss. Look down. Way down. There may be fairies in your neighbourhood. 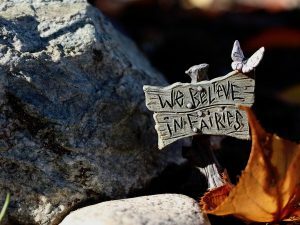 Vancouverites are building community with fairy gardens, but if you don’t pay attention you’ll miss the magic. 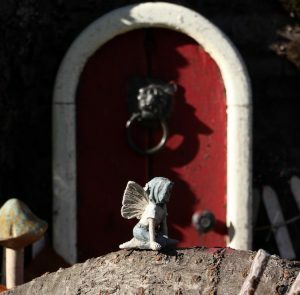 Fairy gardens, usually consisting of miniature doors, picket fences and furniture, are appearing in public spaces across Vancouver. The Jacobsons, who live in the Riley Park neighbourhood of central Vancouver, erected their fairy garden in the spring of 2016. Four others have emerged within a three-block strip over the past year. Get down to ground level to see a fairy soak up the sun in her garden. Fairy gardens won’t fix all Vancouver’s problems, but Kemeny believes every chance we get to interact with our neighbours combats disconnection. 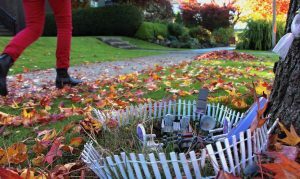 Newcomers to the Jacobsons’ street who built fairy gardens say the activity made them feel more connected to their community. Anna Hennessy says her garden got her family involved in the neighbourhood and gave them the sense that “we’re a part of this.” Another new resident, who joined in the fun, says his seven-year-old bonded with a neighbouring child over their fairy gardens.